Like many fight fans the coming days are going to be very long as we await the anticipated fight of the century. Ok it has taken 5 years in the making, but its hear and I for one cant wait. Actually this is a match makers dream, an attacking whirlwind fighter versus a master counter puncher, possibly one of the best if not the very best the spot has ever seen. Those that say we will see a boring fight, I beg to differ. This will be pure excitement. My prediction is based on the following factors backed by countless hours of analysing past fights among other things. First of all Im a BIG fan of BOTH fighters. I actually don’t care much about what they do in their private lives. I have issues when people want them to be role models. If you have not noticed, they are prize fighters, warriors whose main aim is to go in a ring and defeat their opponent while abiding by the Marques of Queensberry rules. For those that question Mayweathers behaviour, I counter by saying before Manny found religion, rumour has it he was a liquor drinking, smoking and womanising fighter. So let’s leave ethics and public opinion out of this, shall we. Though many will say that Manny is just as fast if not faster than Mayweather, I think the speed would have to go to Mayweather. Though not by much. Also, Mayweather has based his game on speed. Power on the other hand has to go to Manny. For those that say his has lost that, should remember that prior to his move up to Welter he was more powerful. Simply put he is fighting bigger guys, the power is still there. Now when you have Speed vs Power, where is the advantage? At this stage in their career, its POWER no doubt. Ask any trainer or boxer, power is the last to go. Speed on the other hands goes first. Look at all fighters who relied on speed and reflexes at the latter stages of their careers, speed left them first. Be it Ali, Sugar Ray Robinson, Ray Leonard or Roy Jones, speed left first which became their detriment. Power on the other hand is the last to leave. Fighters that had it kept it to their very end. If they clipped you, we could see they still had it. Foreman, Tyson, Julian Jackson, Shavers, Hearns, Foster etc. Up until their last fights, they retained their power. The edge goes to Manny NO DOUBT. Whether you like Freddie Roach and his antics, you must give him credit for being a great coach, especially where Manny is concerned. Remember when Manny was a 1-2 puncher. He is now an assassin in the ring. But apart from that I think that Floyd Sr. relies too much on his fighters to think their way during fights. He never seems to have constructive things to say during a fight. In this fight, the trainers apart from the fighters will have an important role. Mayweather has one of the highest boxing IQs in the sport, but come Saturday, it would have been nice to have another pair of eyes advising you on what you don’t see. They say styles make fights and I couldn’t agree more. Manny has had victories against guys that come at him and has trouble with those that don’t, hence his continual problem with Marquez. Of all their opponents, Marquez seems to be the one that everyone keeps throwing out there. They way that Floyd dominated him and the way that Manny got Ko’ed in the last fight and the controversial decisions. On the KO, I honestly think that too much attention is being placed on this. Since then Manny has fought several times, so from a psychological point of view, I don’t think it plays that much in his head. If this fight were to come after his fight with Marquez it would have been a bigger issue. Another very important point that many forget to mention is that prior to the KO, Marquez was about to be slaughtered. Go back and have a look and you will see that until the perfectly time punch, Manny was going for the kill and got caught, simple. Nothing more nothing less. This is boxing, I have seen this happen many a times. Can this happen against Mayweather, yes but I doubt it. The main reason being Mayweather never commits to throwing these kind of punches. Earlier in his career in lower weight classes he did, but since becoming a Welterweight he has not. I think that his hand issues may be part of the reason. There is no doubt that he has brittle hands and as such he never really sits down on his shots fully. Bradley who did quite well against Manny did so because Bradley has got heart and wasn’t afraid to sit down in the trenches and trade with Manny. I don’t see Mayweather going for this option early, that just not who he is. Also if you want to compare fights, then you would also have to look at their fights with Cotto. I think it’s safe to say that Manny got the best of Cotto when compared to Mayweather. Mayweather is a defence minded fighter that has a great offense. So his focus is to not get hit. His arsenal is enormous and as I mentioned his ring IQ is off the charts. A good example is the Zab Judah fight where he made adjustments and after the 4th round more or less won the fight. But I think he will have problems with Manny. I don’t see Manny coming straight in, I see him more on the left side of Mayweather, which will mean that he will have to reset the right hand. His check-hook is an option, but will he be willing to commit to throwing it with conviction knowing that Manny has that monster right cross? Manny knows that to win he will need to press and that is what Mayweather is banking on, but I don’t think he has the legs and the conviction to do this the entire fight. He will need to sit and exchange whether he likes it or not, and in exchanges I don’t see Mayweather winning. Look for Mayweather to TRY and establish early. I say try because this is not his m.o.. I see him coming at Manny initially to give him the impression that he is not afraid of him. Then trying to establish the area at which he thinks he cannot get hit by Manny. I however see Manny using his footwork to confuse Mayweather, attacking from the left and throwing combinations and STEPPING OUT. I think this is KEY thing that will confuse Mayweather. Many will throw combinations and then Un-Manny like, STEP BACK. 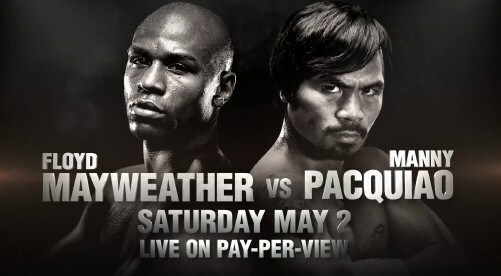 After some rounds Mayweather will have to attack as he will be behind and he will play into Mannys hands. I see Manny winning by 12 UD and believe it or not possibly stopping Mayweather in the late rounds. Reason being, having to go after Manny would go against his nature and he would be fighting out of character. I don’t see Mayweather wining this fight as Manny is a bad matchup for him in this later stage of his career. Strange as it may sound, if this fight had occurred 5 years earlier, I would have picked Mayweather, purely on his speed and elusiveness.